Simon Rowe will offer this unique Shanti Vinyasa Yoga Training to share his teachings of the gentler, lunar practice of Vinyasa Yoga. 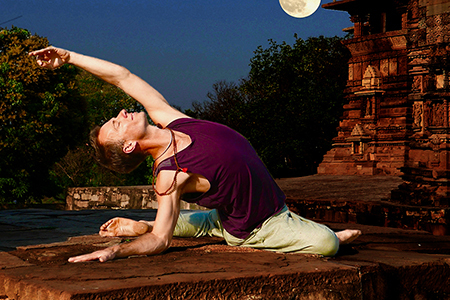 The lunar pathway is an essential part of the original Vinyasa Yoga system as taught by Sri Krishnamacharya. Simon’s teachings are based on his life long experience and his studies with some of the leading teachers within the evolving modern Vinyasa Yoga movement. People nowadays have begun to associate Yin practice with stillness, but this is not a necessary interpretation of the meaning of the Yin concept. Traditionally the meaning of Yin is translated as ‘ intuitive, submissive, inward, downward, soft etc.’ All energy is movement and both Yin and Yang energy can be explored through movement based practices. For thousands of years already, practitioners have nourished their Yin during gentle movement practices. During this module we study wonderful lunar/Yin movement based practices for healing, rest, and regeneration. It is at the heart of our Yoga tradition to use movement and breath in order to release tension that blocks the flow of Prana, life energy. Druring lunar yoga practice, we learn to open to the healing flow of gentle movements and postures. Our nervous systems and outer mind are invited to reset and relax through the grounding, harmonizing movements and the slower tempo of movement and breath. During a lunar yoga practice the body can be opened in all directions just as in a solar class but with less physical effort, working closer to the ground and surrendering to the force of gravity. Learn to initate all movements from the breath and to nourish the body with healing Prana through energetic breathwork and the sacred breathwave. Learn how to gently apply inner bandha support to increase inner space and ease of movement. Lunar, flow based practices are very suitable to people recovering from burnout as well as to seniors and for those who prefer less weight bearing practice on their hands and wrists. Ojas which is described in Ayurveda as the inner honey, essence of our own vitality and immunity increases through such nourishing and healing practice. - Tools for guiding students back to the self through gearing down, grounding and harmonizing the breath. - Energetic breathwork for opening the inner energetic gates, moving and balancing Prana through all meridians and cells of the body. - De-armouring - healing movements and dynamic meditations for somatic repatterning and deep stress release in flow. - Shanti Vinyasa Sequences for honoring the lunar pathways and effortlessly opening the body in all of the directions. - Using inner bandha support and the sacred breathwave to harmonize the flow of Prana through the main meridians of the central channel and the 7 chakras. - Tools for cultivating the bhaav, feeling state of mind, through satsangs, music, guided -visualizations, mudras and mantras. - The teachers voice - vocabulary, metaphor and the inner poetry of the body as tools for deepening the inner connection. - Heart Jewel, Awakening our compassionate and peaceful nature, accessing the inner wisdom of the heart through kumbhaka and karuna. Do you want to combine your Advanced studies for a 300 Yoga Alliance certificate? CLICK HERE> for more information.